Whether you are actively blogging and tweeting your way through the course or just watching others do so, we’ve arrived at Week 5 and this week’s topic is platforms and technologies. Technology use has spread across most learning activities. Where once teachers had chalk, talk and occasionally OHPs (over-head projectors), now there is a broad range of digital technologies that you can used to stimulate learning, both online and in the classroom. The problem now is finding the right technology for any given learning context. So this week we will look at what different technologies and learning platforms can offer, and how they could be used to inspire learning within your context. If you currently use a learning platform, this will be a good opportunity to reflect on whether you are using it optimally. There are opportunities to talk about your own scenarios and to tell stories of how you embed technology in activities to nurture learning. Are you an ocTEL-ler like Sherlock Holmes? Before we get on with the new material, however, here’s a chance to think about how ocTEL is working for you and how to keep on track – not by catching up, but by sifting through what you don’t need or don’t have time for. Sherlock Holmes famously described his mind as an attic, in which only knowledge that was essential for being the world’s only consulting detective would get stored. So with your own constraints in mind – teaching commitments, deadlines or indeed a personal life – give yourself a few moments to re-focus on what’s important for you and your practice. …And leave everything else behind. ocTEL materials and recordings will remain available after the course has finished, so if you want to refer to them afterwards or revisit a topic you didn’t have time for, you can. applying your understanding about pedagogical affordances to current trends such as MOOCs and other open platforms. This week’s ‘one thing’ is to think about three key questions and post a response to one or more of them online. 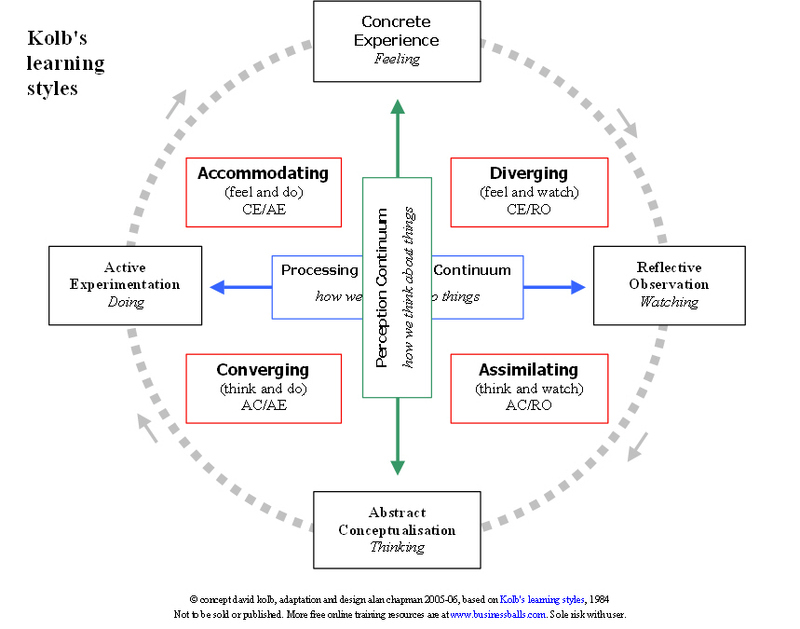 First, refresh your memory about Kolb’s Experiential Learning Theory and look at the diagram of the learning cycle and learning styles. Then think about one or more of these three areas. Reflect on whether you accommodate these learning styles in your teaching practice. Do the technologies you use help you achieve this? If so, how? Or do they hinder it? What tools relate to the quadrants of the diagram? Does the situation change if the activity is accessed from a mobile, or done ‘in the field’? What other types of technology works well with activities in these quadrants? For example, where do classroom clickers (mentioned in the Eric Mazur story in Week 1) belong? What about social media? Respond to some of these questions on your blog or via Twitter (using #ocTEL tag), on this forum topic, or via the JiscMail list. This week’s webinar runs at 16:30 UK time (GMT+1) – note the different time this week – on Wednesday 15 May. You will be able to access it from half an hour before the start via this link. This week’s webinar is on platforms for Massive Open Online Courses (MOOCs) and focuses particularly on the connectivist style of courses, often taught by individuals or small teams of academics. As well as an overview of emerging trends there will be a behind-the-scenes look at the ocTEL platform. ocTEL is built on the open source WordPress blogging platform, which technical architect Martin Hawksey has augmented with a set of additional plugins and some custom coding. Participants will gain an insight into the challenges of developing and running a connectivist-style open course and have the opportunity to quiz Martin. Get your Sherlock Holmes deerstalker cap on #ocTEL (anyone posting a picture of themselves wearing one will win a prize). Post your thoughts on one or more of the three key questions. Discover what makes ocTEL tick at the live webinar. This week there is a lot to choose from in terms of activities. The field of platforms and technologies is wide, so we want to give you the choice of different pathways for exploring it further. Hence this week it’s a pick-and-mix approach to activities, with you selecting the one(s) you want to focus on, either to deepen your understanding of technologies you work with now or to find out about new ones. Unless this is the principal area of your interest in ocTEL, we advise against trying to do all the activities. Read the Methodology and Pedagogical Dimensions sections of Hill et al (2012) paper (full text as a web page, or PDF) and think about the four dimensions mentioned (logistical, practice based, pedagogical, participation). Which of these considerations is the biggest driver towards your adoption and choice of technology? How does this relate to the learning activity dimensions you may have identified in Activity 1.2? On your blog or via Twitter (using #ocTEL tag), on this forum topic, or via the JiscMail list, tell us you stories about using technology in your teaching, and the platforms you use. If you’re looking for inspiration, remind yourself of some of the stories from Week 1. Please choose one or more of the following platforms and technologies, carry out the activities and then participate in the discussion described at the foot of this activity. Watch this 16 minute presentation (click play to hear audio) by Steve Wright (Lancaster University) at describing how use of Virtual Learning Environment tools to good or poor effect can affect effectiveness in achieving learning outcomes. Then enrol on ‘Introduction to Moodle for e-moderating’ course on Lancaster University OpenLearning platform by following these instructions. You are free to download the Moodle backup (.mbz) of this course for adaptation and re-use. Please view this recorded presentation (40 minutes) by Graham McElearney and Rachel Horn (The University of Sheffield), which provides an overview of how Google Apps can be used in learning and teaching. thinking about the kinds of support and issues that might arise. Think of your own activity and use this form to record it. You can see the collated ideas from everyone’s contributions so far. You may also find it helpful to read this 2012 article by Graham McElearney, which outlines some of the issues that you would need to think about when supporting a new technology – in this case focusing on Google Apps. For an alternative, slightly more promotional view, see this five-minute video about Google Apps for Education. Use this forum topic to share practice in using synchronous online classroom technology – for example, Adobe Connect, Blackboard Collaborate (which we use for ocTEL webinars), Cisco WebEx, Google Hangouts or even Skype – such as effective use of the available tools or ‘netiquette’. On your blog or via Twitter (using #ocTEL tag), on this forum topic, or via the JiscMail list, please address some of these questions, thinking about how you use your learning environment. What is your current virtual learning environment or the main technology you use? How does it differ from the ocTEL platform? What learning styles does it afford that ocTEL cannot? Where is it restrictive? Is it ‘open’ in the sense that you can develop or configure tools that fit your pedagogy (e.g. the learning styles above), or does it command a certain pedagogy? What are the wider implications of enforced platforms and technologies for higher education? How can your learning platform promote inclusion? Activity 5.3: What does Open Source mean to you? By now, you should be aware of the kinds of possibilities for your course and your pedagogical approach that technologies and platforms can offer. Let’s consider the ‘means of production’ used to create these platforms, and what implications they have for education, especially MOOCs. Read the notes and commentary about Open Source below and watch this TED video of Clay Shirky (from 2 mins – 11 minutes) to help you understand how Open Source developments have changed the way we think about building tools. How does it differ from past initiatives for open content such as iTunes U or Khan Academy (mentioned in Week 4)? How does open content differ from open education? When teachers choose which technologies will fit their learning context most appropriately, there are a number of factors that inform their choice. Hill et al (2012) suggest that course dimensions are defined by logistical (e.g. class size etc. ), practice based (e.g. lab, lecture, seminar etc. ), pedagogical purpose (e.g. constructivist etc. ), and participation (e.g. contact environment: distance, blended, campus, fieldwork etc.). Each of these suggested dimensions brings a new set of variables into the equation, changing the shape of the course with each cohort and teacher. This is addressed in Activity 5.1. It is also worth thinking about a higher view of this topic, looking at the benefits and drawbacks of using Open Source technology, and the types of learning style that are embedded in proprietary course platforms, such as Coursera. How does this differ from the learning on this course? How does this differ from previous attempts at open content, such as iTunes U? Open Source refers to the development process from which the tool emerged. It means the product is free to use, but more importantly that the codebase is totally open for modification at all times. So while a community will keep the core software up to date, extra functionality is ‘crowd-sourced’ in the sense that anyone can modify or extend the software’s features dependent on their local need. Some changes will be committed ‘upstream’ to be accepted into the next version of ‘core’. This process is usually managed on platforms such as GitHub, or SourceForge. It can be quite difficult for non-technical people to see how important this actually is. It sounds almost semantic to someone who doesn’t understand software development processes. Ultimately this is about power and control. Within educational technology, power and control basically means the forms of pedagogy that a tool enables or prevents. Open Source enables control at a super-local level, as anyone can modify the code for their particular use case, and commit their change back ‘upstream’ for everyone else’s benefit. Next week’s topic: Assessment and Feedback, starting 20 May.